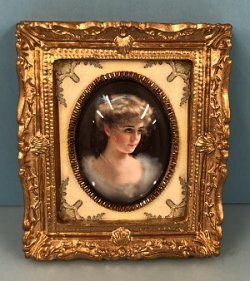 A LOVELY GLASS CAMEO STYLE PICTURE WITH DECORATIVE GOLD COLOURED METAL AROUND CAMEO. IT IS IN A GOLD SWEPT FRAME. THE BACK IS FINISHED IN VELVETEEN AND STRUNG READY FOR HANGING. MEASURING 2 1/2" WIDE X 2 3/4" LONG. Carefully hand crafted to a very high standard.